Had some scrap wood left over so decided that I needed a carpenters tool box. I got tired of making several trips from the shed to wherever I was working. I wasn’t a fan of the standard handle across the top, so I made a smaller handle onto a tray for small tools or parts. It works as is now, but I’ll probably give it a couple of coats of polyurethane when I get around to it. Chilly P, good to hear from the Australian contingent. This is a nice design. Why did you make the end caps for the top tray more narrow than the sides? The advantage of a longer handle is that it lets you adjust your grip to balance the load. This carrier may need wheels if you load it up. It helps readers if you include dimensions in your post. This was my take on this same problem. Click here. Rough dimensions only as i made it from off-cuts, 700L x 320W x 400H. For extra strength, I glued the two shorter blocks to the sides first, then slipped the handle in and nailed it in place. They were off-cuts from another piece and I couldn’t find any others that matched as closely. I don’t know where I picked up the quote from, but like it better than the original. I like it. 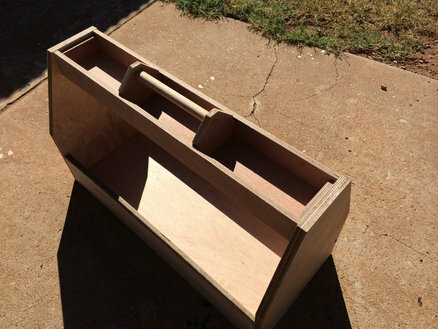 Will have to put this on my list of tool boxes to make.